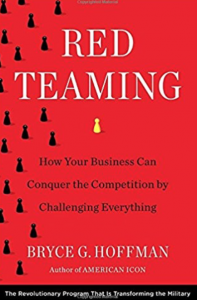 Even before starting “Red Teaming: How Your Business Can Conquer the Competition by Challenging Everything” we presumed from the title it had military roots. It does, and it also starts with a quote from Sun Tzu’s “The Art Of War,” but that’s where the cliches end. The book covers the historical and military associations of the term, of course, but elegantly transitions the concept to stress-testing and contrarian thinking, in the context of business planning. Having a solid background in business, psychology and behavioral economics are helpful before staqrting this book. It’s a detailed, worthwhile read that will help you overcome your confirmation biases and create counter-arguments, worst-case scenarios, and expose weak points in any forward-looking business plans. This book was provided by Blogging for Books; all opinions are our own.